mid-13c., from Old French saphir (12c.) and directly from Latin sapphirus (source also of Spanish zafir, Italian zaffiro), from Greek sappheiros "blue stone" (the gem meant apparently was not the one that now has the name, but perhaps rather "lapis lazuli," the modern sapphire being perhaps signified by Greek hyakinthos), from a Semitic source (compare Hebrew sappir "sapphire"), but probably not ultimately from Semitic. Some linguists propose an origin in Sanskrit sanipriya, a dark precious stone (perhaps sapphire or emerald), literally "sacred to Saturn," from Sani "Saturn" + priyah "precious." In Renaissance lapidaries, it was said to cure anger and stupidity. As an adjective from early 15c. Related: Sapphiric; sapphirine. The importance of the origin of sapphire is more important than with most gemstones. The following are the most commonly used origins in jewelry for sapphires. Thai sapphires tend to have a bit of a dull blue-green tone to them and seem hazy compared to others. Thai sapphires tend to be dark blue or black. Burmese sapphires are really set apart for their clarity, and intense royal blueness. These stones, although atmospheric and gorgeous, are much more crisp and tonally blue than Kashmir. Kashmir Sapphires far exceed all of the prices and desired attributes of any other sapphires. These stones are often described for their “sleepiness” because of the silky, atmospheric properties of the stone’s internal structure. It really does have a dreamy effect and although they are an intense blue, they have a purple ring to their color. Those Kashmir stones were found on just on side, of one hill in the Indian state of Kashmir and were mined almost all mined out during the 1930’s. There are a few stones found every year with the return to hard-rock mining in that mine, but it is thought that those stones are limited, and therefore the Kashmir sapphires are the most expensive, due to their rarity. Talisman: Sapphire is a symbol of wisdom and knowledge, this is why it is often associated with education, a healthy memory and as a guard against envy. In Ayurvedic practices, sapphire is often used to treat issues created by our environment, such as nervousness, worry, stomach aches, digestive issues and bloating, as well as rheumatism and inflammation, and skin problems such as eczema. 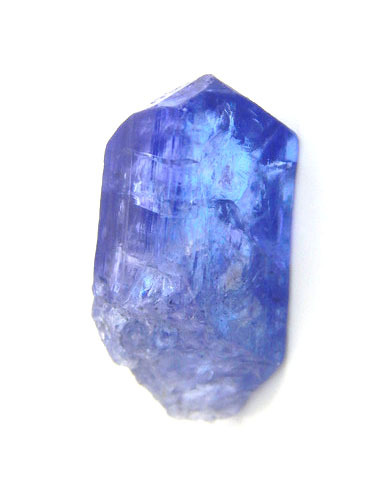 Grading: A nice sapphire should be bright, clear and not have any foggy areas which are often referred to as “silk” or veils, which are caused by minute rutile threads that run parallel in the crystal. If enough rutile threads run through the crystal in equal directions, a star effect can be found, these are star sapphires and are sought after for the highest contrast and star effect, called asterism. The clearer the star sapphire, the more expensive it would be, because it will heighten the contrast of the asterism, rather than fogging it out. In other sapphires, some inclusions are desirable too, such as in the Kashmir sapphires which have an equal spotting of inclusions that give them a velvety look, but only with significant, intense color saturation. All sapphires are part of a family of minerals called corundum, including ruby, which is an extremely hard aluminum oxide composition. Sapphires come in many colors, such as violet, green, yellow, orange, pink, purple and of course a variety of different blues, being the most recognizable. In its purest state, corundum is actually colorless. Colorless sapphires were once popular diamond replacement, and have made a return to popularity in recent years. Clear sapphire is rare to find naturally, because most of the corundum family will include trace elements that cause there to be color in the stone. For example, in a blue sapphire, it only takes a mere hundredth of a percent of titanium to cause the blue color in the mineral. In ruby or pink sapphire, trace elements of chromium cause the coloration. Most gemological institutes do not grade sapphires, however they can provide a report of the mineral composition of the specific stones, with a general determination of it’s origin. Blue sapphires have been one of the most sought after gem stones in the history of gemological collection and interests. Although fabled as far back as King Solomon and the exchange with Ceylon and her stones in the 10th century bc, the oldest known example, specifically, of sapphires in the west only date back 1000 years with the octagonal shaped, rose-cut St. Edward’s Sapphire. In 1042, St. Edward’s Sapphire was set in a ring and worn as his coronation ring until his death in 1066. He was buried with the ring in Westminster Abbey, where it sat for 97 years until he was canonized and his body was reinterred and move to a shrine in a chapel that was built in his name. The stone was taken at that time, to be placed with the relics associated with him, but it somehow ended up with the royal jewels, and miraculously survived through the years and changes of power. It was last set in 1838 as the center of the top cross finial in Queen Victoria’s Imperial Coronation Crown, along with one of the largest of sapphires in the royal jewels collection; the Stuart sapphire. Left: The imperial crown of Queen Victoria, 1838. Center: The chapel and shrine of St. Edward the Confessor at Westminster Abbey. Right: The imperial crown of Queen Victoria, after 1909, was set with the Cullian II diamond, at which point the Stuart sapphire was re-set in the reverse of the crown. The Stuart Sapphire is a giant 104 carat oval-cut sapphire with a fine blue color gradient. Its the center piece to the head-band of gold on the crown, which is set with a multitude of rose-cut diamonds, emeralds, sapphires and rubies. The Stuart sapphire is thought to have originally been worn as a pendant, the reason for this is that the stone was drilled through the center to accommodate a bail, which explains why the oval-cut of it is asymmetrical in the crown. The Stuart sapphire is named after the Stuart royal family, who “reunited” England and Scotland over a tumultuous 400 years of exchanges. They had taken the sapphire originally from Scotland, as far as we know, and it bounced around the monarchs, even leaving with James II in 1688 when he exiled to France. A century later it was back on English soil, where it ended up in the hands of King George who passed it on to his grand daughter Victoria, and set in her coronation crown. In 1909 the Stuart sapphire was moved from the center-front of the crown, to the center back of the crown to make room for the outstanding Cullian II diamond. Left: Polly Logan when she was still Mrs. Guggenheim, pictured in a 1950 tour of her home during a party and publicity spread about her estate Firenze. 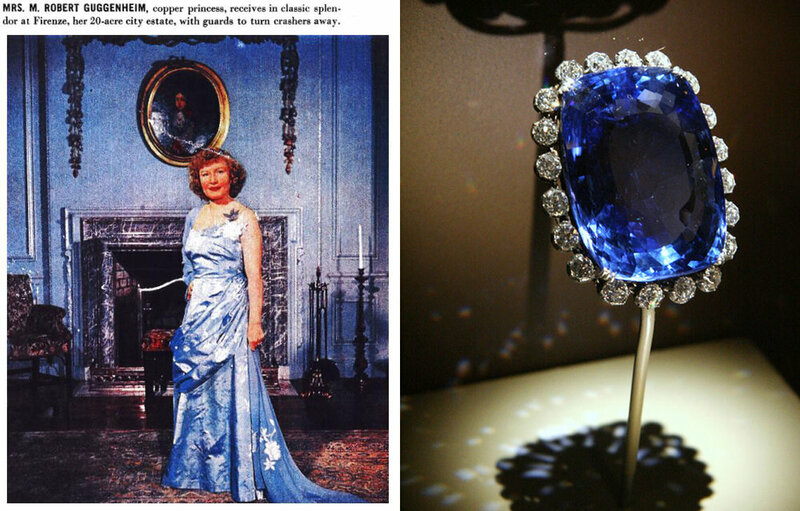 Right: The Logan sapphire on display at the Smithsonian in Washington D.C. Even the grand, romantic, and somewhat sad story of Wallis Simpson includes one of the great sapphire of the 20th century. Between 1949 and 1966 the Duchess of Windsor collected a group of jewels from Cartier’s “Pantheré” collection. This collection was inspired by the water color that George Barbier did in 1914 for Louis Cartier Jr. which turned out to be a great advertising campaign and embodied the early Art Deco in Paris. In the 1930’s the Cartier brothers brought Jeanne Toussaint into the fold, and did she embodied the style and love of jewelry that Cartier represented. In fact she was the chief reason for the Pantheré collection, which has been a seasonal staple of any of Cartier’s designs. Left: Wallis Simpson, the Duchess of Windsor. Center: In 1949 the Duchess purchased this Pantheré brooch from Cartier. The white gold and platinum clip features a 152.36 carat Kashmir cabochon-cut sapphire. Right: The original panther advertisement illustration for Louis Cartier (Jr) and Bros. by George Barbier in 1914. In February of 1981, on both sides of the pond, the hearts of the public were won over by a young woman from Sandringham, Diana Spencer. Her family had a long lineage with the royal family, so it was no wonder that, in that year, she was engaged to Prince Charles, and slated to be the next queen of England. However, we all know the story; 2 princes, and an unhappy marriage in the paparazzi lens and wham, a scandalous divorce from the monarchy, and a nightmare ending with a fatal tryst in Paris. Her graceful demeanor and flare for fashion, yet inability to escape the formality of her station, lead to a constrained sense of style that was glamorous yet contained and so proper for someone as outspoken as her. When she was engaged, she wanted a ring that reminded her of her mother’s hands, so she settled on an unusual choice, a 12 carat oval Ceylon sapphire, surrounded by 14 solitaire diamonds in a 2-toned gold cluster-style mounting by the jewelers Garrards & Co. of London. After her death, each of her sons was allowed a memento of her personal effects, her youngest, Harry chose the sapphire ring, while his older brother, William, chose her Tank Francaise watch from Cartier. 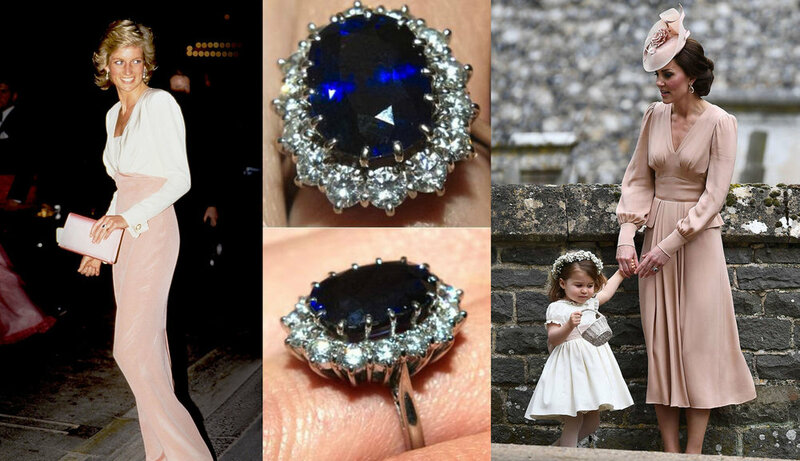 In 2010, when Prince William proposed to Cate Middleton, the brothers swapped these mementos, and Cate has worn the sapphire ring ever since. Left: Princess Diana, wearing a pink dress by Catherine Walker, 1990-92. Right: Catherine, Duchess of Cambridge, with daughter Princess Charlotte on the day of Pippa Middleton's wedding, 2017. Whether Sapphire is your birthstone, or it has won you over as a special stone that holds on to some sort of idea, we hope to be able to offer you something special for that special something. Please check out our selection of all sapphires by searching in search bar on our home page or clicking here. Newer PostLa Pantheré... The story of Jeanne Toussaint and how she went from nothing to EVERYTHING!